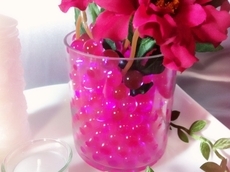 Jelly-decor, also known as the water pearl centerpiece, has been trending in the wedding decorations industry since 2011. These are beautiful, crystal like water pearls that are perfect for adding colors and glamour to any decorations. Jelly-decor from IdeaRibbon comes in a variety of colors, such as pink, blue, black, clear, and many more! You can even mix and match colors to create amazing displays. Just add water to make. Water pearls can hold 100x their weight in water, and are reusable. 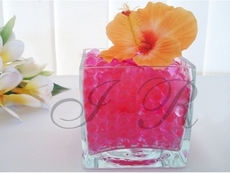 1.4 oz of jelly-decor creates approximately 5.75 L or 1.5 gallons of water pearls.